Let's see your hop plants!! Re: Let's see your hop plants!! Here’s this year’s crops on their way. Closest is the Willamette, then the Saaz, and on the far corner the Cascade is about 3 feet. The Saaz is about 7 feet now. Just finished taking care of the weeds and gave the hops fertilizer. My Centennial hops on the left and my Cascade hops on the right. damn caterpillars are killing my hops. found multiple nests and killed them but its to late for my cascade hops might get some but nowhere close to what i should of got. Here's a pic of some of the nests I cut out. I couldn't reach them all, so I can only hope. Combat32 sent me some Cascade and Centennial rhizomes earlier this year. 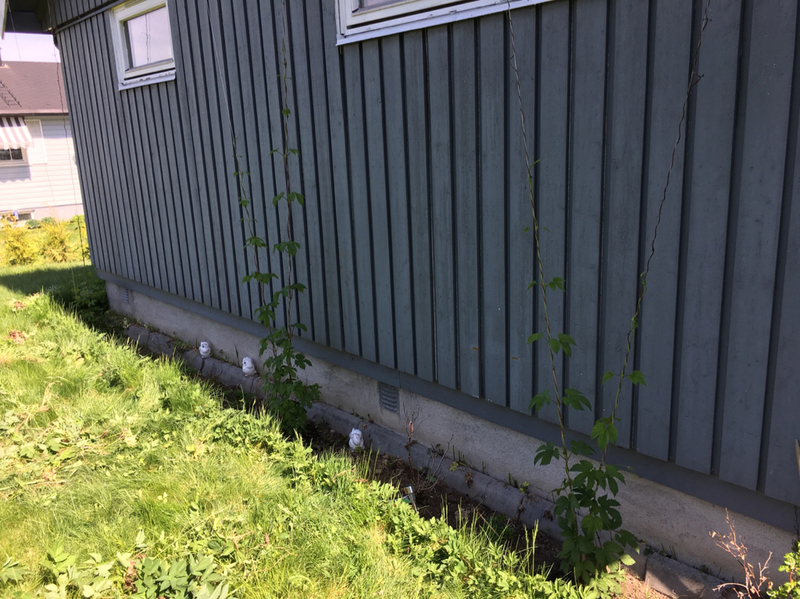 Thank God I didn't kill them, and frankly I wasn't expecting any hops from these baby plants, but I've got some mini hops that are now growing on the 10 foot sticks of EMT conduit ! I don't know much about hops, but if they are like most perennial plants I'm hoping they should double in size next year. glad to see they survived the trip, i knew they would. next year make sure you use some twine to hold them. EMT can get pretty hot in the sun. plus its easier for the bine to climb it.